Sea of Stars QAL: It's a flying geese chase! 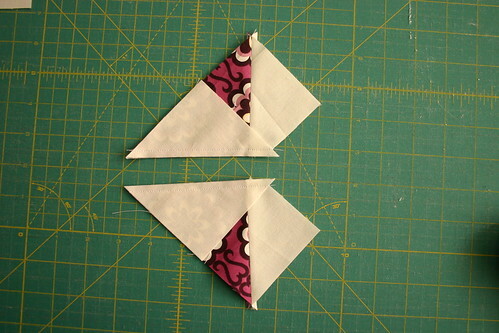 Just as there are several different ways to make half-square triangles, there's several ways to do flying geese. I'll show you the two methods I use most often, and you can decide how you'd like to make yours for your Sea of Stars quilt, or you can pin or bookmark this page for future reference! 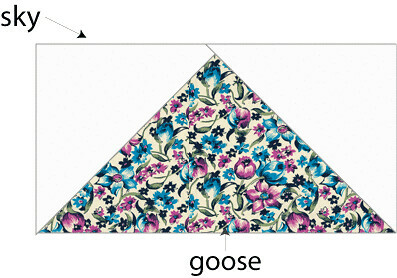 A flying geese unit is made up of two integral parts, the geese/goose and the sky, creating a rectangular unit used very frequently in quilts and blocks. 1. Using a ruler, draw a line across the diagonal of all of your white squares. I like to use either a Frixion pen, which disappears when an iron is applied to it, or a Hera pen, which creates a crease rather than an ink or pencil line. 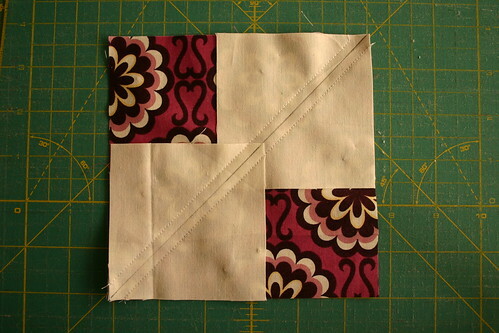 Then, place one at a time on the 2 1/2" x 4 1/2" rectangles, as shown below right sides together, with the diagonal line going from the bottom right corner of your rectangle fabric and continuing up to the center of the rectangle fabric. 2. Stitch just a few threads to the right of your line, just slightly closer to the corner. 3. 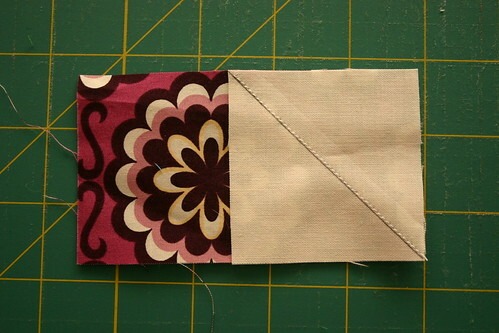 Fold back your white fabric to line up with the corner of your printed fabric. Press well, using a hot, dry iron. 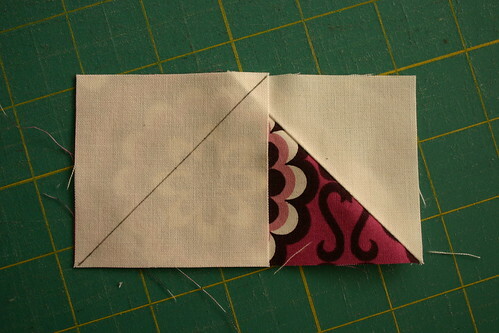 Trim excess seam allowance down to 1/4". 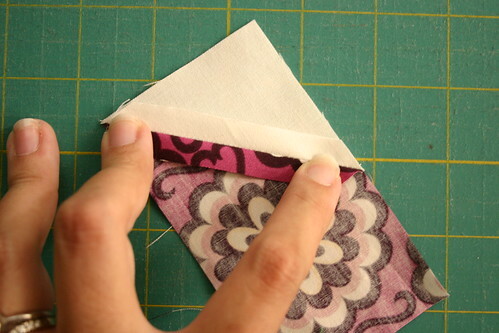 A word on waste: To avoid making waste in this step, you can add an additional seam approximately 1/2" closer to the corner from your first seam. 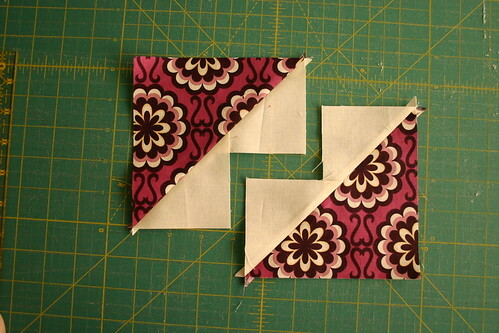 Then, when you trim to a 1/4" seam allowance, you create a bonus half-square triangle, to use in a future project. You can do this on both sides of the flying geese units, using this method. 4. Using the remaining white square, line up raw edges and ensure that your diagonal line makes a triangle when it intersects with the existing neutral square/triangle. 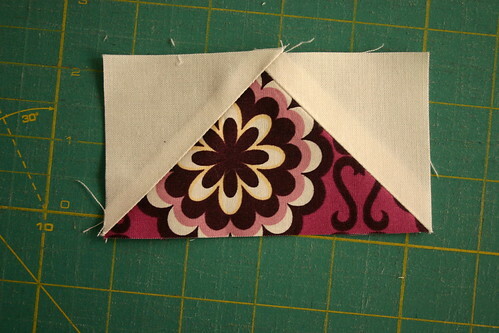 Stitch just a few threads closer to the corner again, fold back, press, and trim excess seam allowance. Honestly, as much as I enjoy the lack of waste in this method, I must be just set in my ways, because I rarely actually use this method, though it is a solid flying geese method. 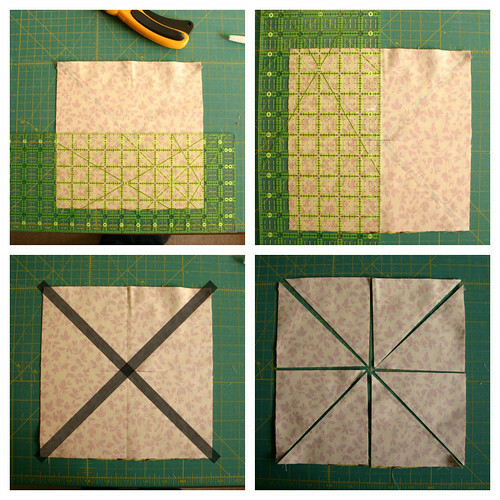 A math note: to calculate your own flying geese using this method, simply start with the width of the finished flying geese unit you plan to make, for example here, it's 4 1/2". Add 1 1/4" to that, which in this example equals 5 3/4". 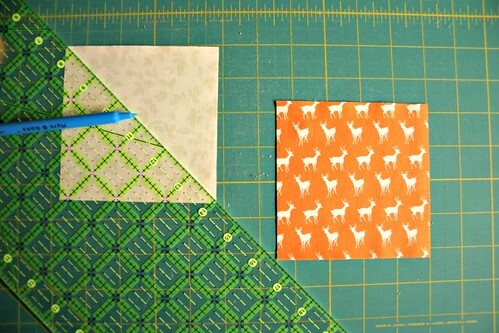 That is the size to cut your geese fabric, shown here in a printed fabric. 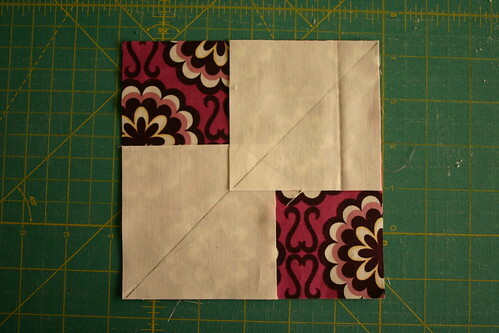 One geese square will yield 4 finished flying geese units. 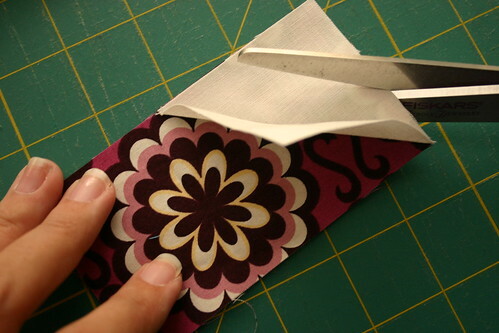 To determine the size to cut your sky fabric, use the height of your finished flying geese unit and add 7/8." For this example, the finished height is 2 1/2", so when you add 7/8" to that, you get 3 3/8". 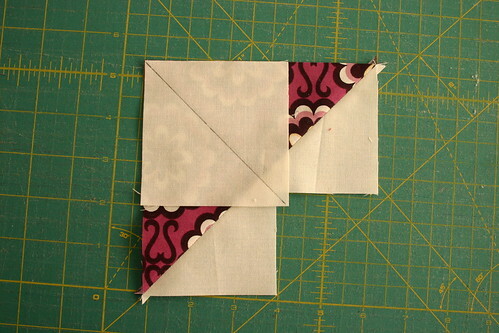 Then, cut four sky squares using that calculation, to create the four flying geese units this method yields. 1. Just as we did in Method A, draw a diagonal line on the wrong side of all four of the white squares, using the marking tool of your choice. Place two of the white squares, on the geese square, right sides together, aligning the raw edges of one square with the bottom left corner, and the other square with the top right corner of the geese square. Make sure that the lines you drew align in the center, where the two squares will overlap slightly. 2. 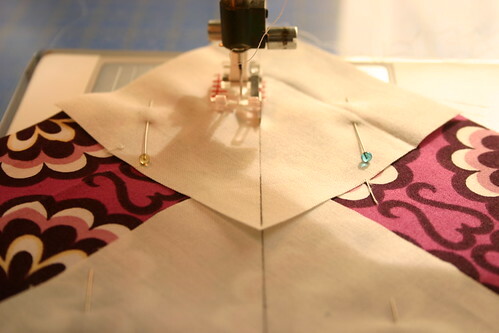 Sew a scant 1/4" seam parallel to the lines you drew on the white squares, on both sides of the line, for a total of two seams. 3. Cut along the marked line, and ta da you'll have two units! But they're not flying geese just yet. :) Press the seam open for both units. 4. 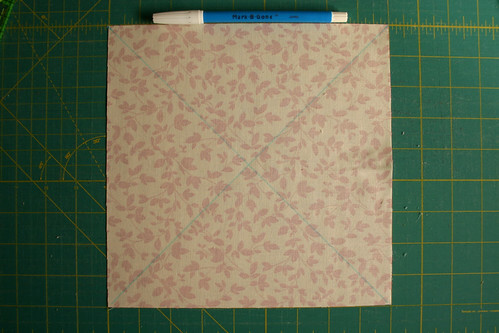 Take one of the two units and align one of the remaining white squares with the printed corner of the unit in progress, right sides together. 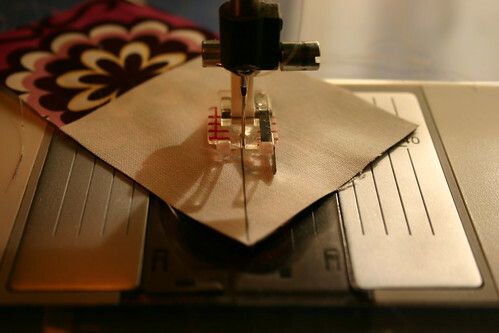 Make sure that the marked line is pointing from the corner of the printed fabric through the two white triangles sticking off the printed fabric. 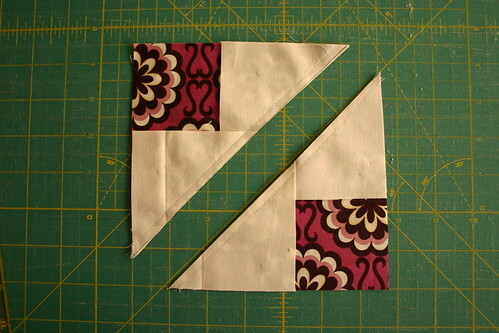 This square will hang off the edge slightly, between the two white triangles. 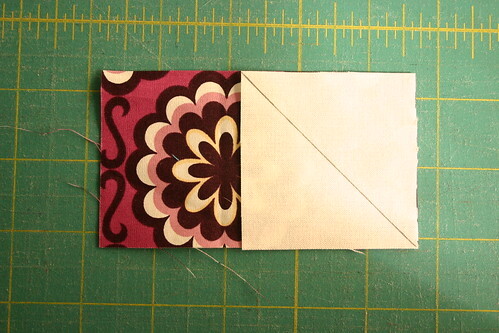 Sew a scant 1/4" on both sides of the line, then cut on the line. 5. Ta da!!! Two flying geese units! Press the seams open, and then repeat with the remaining white square and remaining unit in progress, and you'll have four flying geese units, with no waste. Before you sew your flying geese into your blocks, you may want to trim the dog-ears (the pointy bits sticking out over your flying geese). 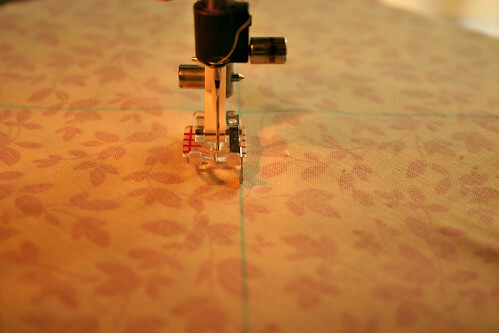 Admittedly, I very rarely do this, because I like to take shortcuts, and I know my machine doesn't have any trouble sewing right over those dogears. I think one of the reasons dogears aren't an issue for me is because I press my seams open. Do what works best for you and your machine here. Have a wonderful Friday and a great holiday season weekend! 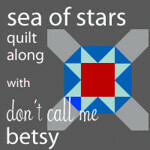 Welcome to the first post of the Sea of Stars Quilt Along! 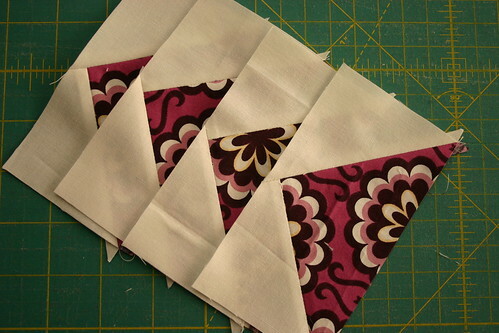 If you've already got the pattern, then the next step to take is to pick your fabrics. Oh, how I love fabric. Fabric selection is definitely one of my favorite parts of the quilting process. So, let's talk fabric, shall we? For my quilt, I used some Michael Miller Cotton Couture solids mixed with charms of Liberty of London's Bloomsbury Gardens. When I started thinking about this quilt along, I started to think about what fabrics I would pick for my next Sea of Stars quilt. Near the top of my list is using Madrona Road, which is quite possibly my favorite fabric line of 2012. I happen to have some in my stash, and I think it would work really nicely with this pattern. Another line I'm thinking about using is Mama Said Sew. 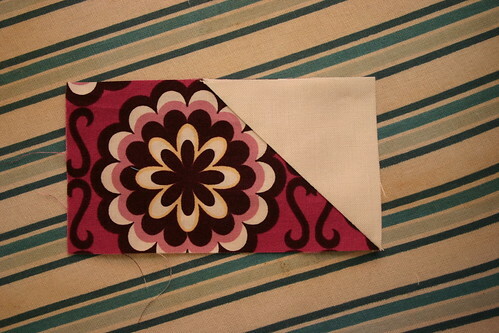 I love the contrast in the colors here, and I've got a fat quarter bundle that is screaming to get used. I love the classic feel of the red, black, and grey in this line, and the text prints in this line are just fantastic. 1) I'd recommend sticking with small to medium scale prints, if you're using prints. Large scale prints will really get lost in this pattern, since the pieces are fairly small. 2) When selecting your fabrics for the lattice of your quilt (shown in light gray on my quilt), if you use a directional print, order some extra yardage, as you may need to use more fabric to ensure that your directional print is uniform throughout. 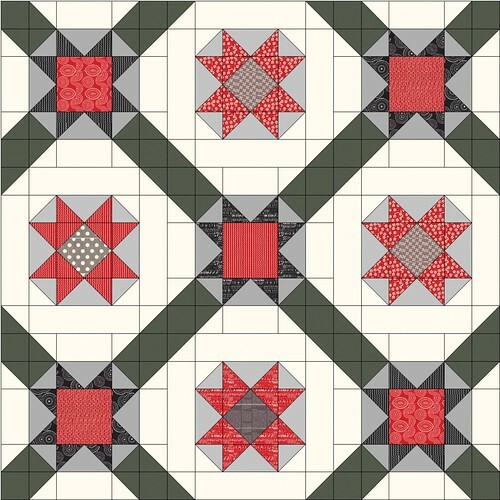 Solids are great for the lattice, but a using a print would be a great way to make your quilt unique. 3) Don't be afraid to use more color on this one! 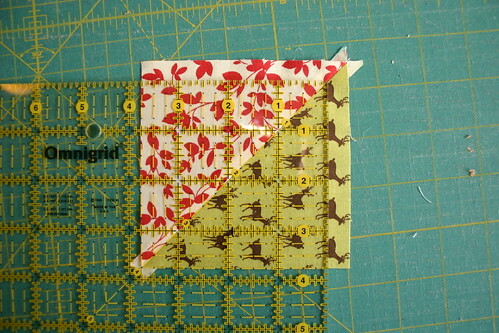 Use a bright contrasting color for your lattice, for instance, or for your star frames fabric. 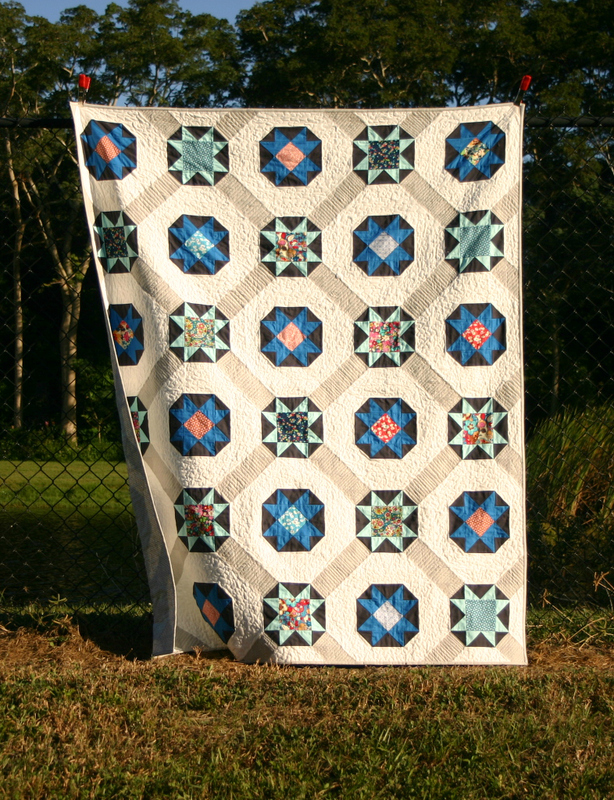 I am so excited to share with you about my newest quilt pattern, Sea of Stars. Sea of Stars is now available in my pattern shop as well as my Craftsy shop! 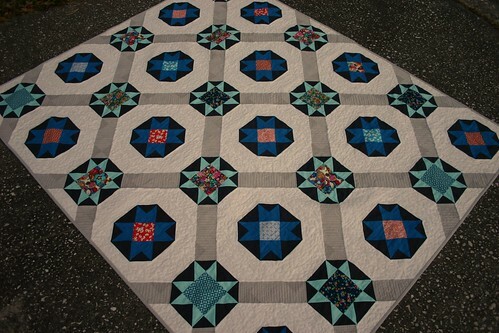 This quilt comes with five size options for your convenience: baby, lap, twin, queen, and king. 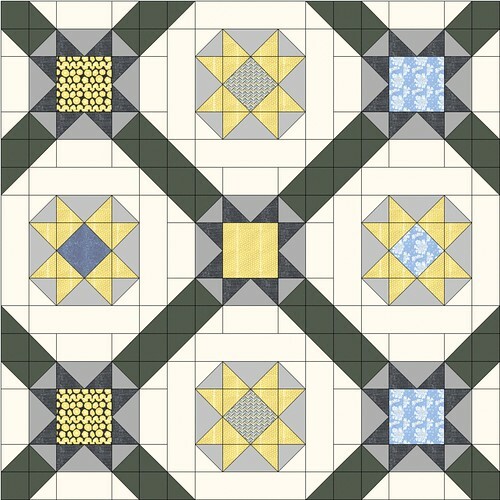 This quilt pattern was inspired by a tile layout I saw once in a restaurant, and I love the way it looks in fabric. 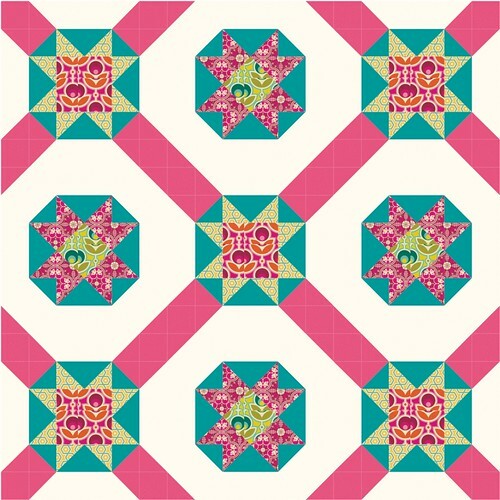 For the pattern sample, I made a lap sized quilt, using some gorgeous Liberty of London Bloomsbury Gardens prints as the centers for all of my stars. I used some beautiful Michael Miller Cotton Couture solids to pair with the Liberty prints, and I just adore working with the Cotton Couture fabrics! 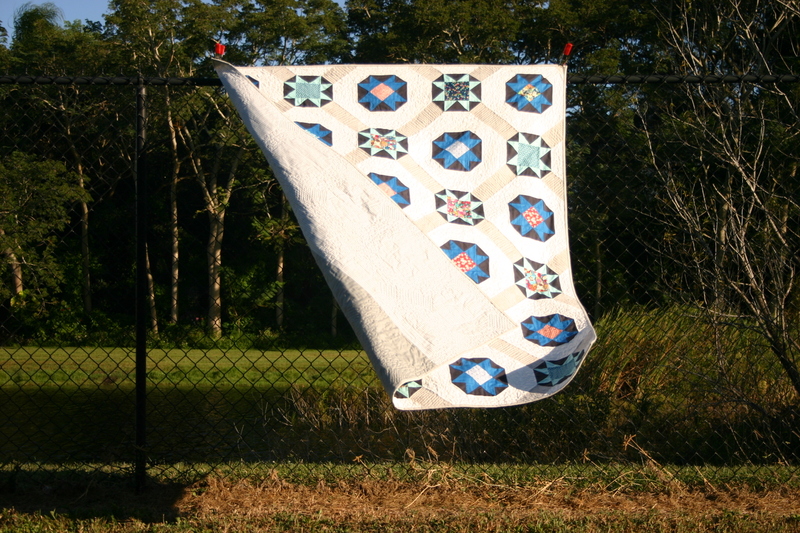 The quilty photoshoot for this pattern was a bit of a mess - it was the windiest day I've seen in a long time, and I nearly lost the quilt to a retention pond, but thankfully I grabbed a corner of it before it flew away! 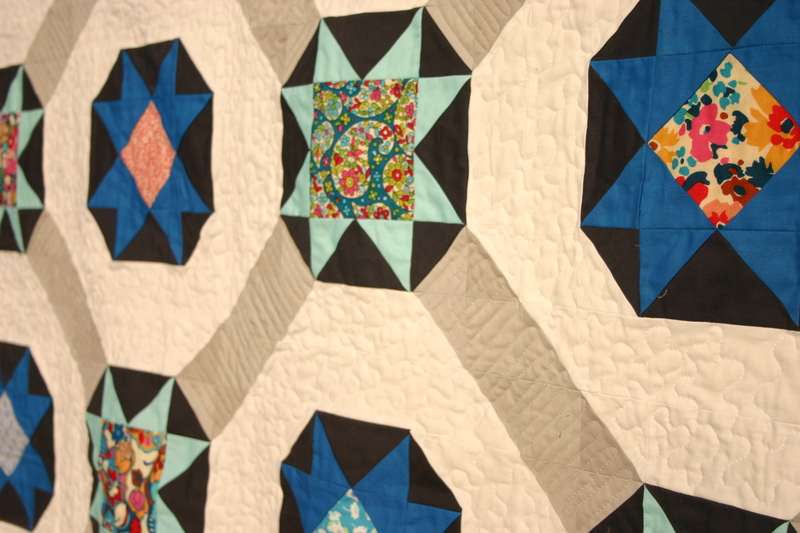 If you have a moment today, pop on over to Amy's Creative Side, where voting has opened up for Bloggers Quilt Festival. My mariner's compass mini is nominated for Best Mini/Doll Quilt, and I'm so honored, I'm in such great company! Have a wonderful Tuesday!